incontinence | Live Cheap, Feel Rich! So I just had a pretty awesome first “Twitter Party” experience for #ConfidentKids promoting Goodnites Tru-Fit machine washable underwear. These are for older kids who are still having bed-wetting issues, as they use absorbent inserts for outstanding nighttime protection. Honestly, I’ve experienced delayed potty training once in my family, and I can tell you it’s tough. Tough for both me as a mom in terms of maintenance and exhausting efforts to stop it, and tough for my daughter as she struggled with confidence issues, delayed and avoided sleepovers and any overnight social event. Crippling for us both! Goodnites are discreet and look just like real undies – the other kids won’t know, and your kid won’t feel like a baby having to wear diapers or pullups. Definitely an awesome option for bedwetters. 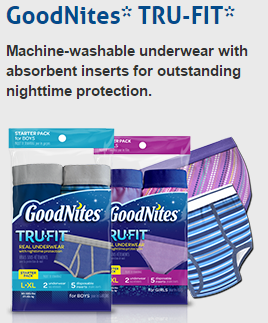 Click here for a $4 off Goodnites Starter Kit coupon!